Hanukkah is a joyous celebration of Jewish national survival and religious freedom. During Hanukkah, many families invite relatives and friends over to light the menorah, sing songs, play dreidel, exchange gifts and enjoy traditional Hanukkah food, especially latkes (potato pancakes). Lighting the eight candles in the menorah commemorates the miracle of light, representing how the Holy Temple had enough oil in the menorah for just one night, yet it remained lit for eight nights. Thus, oil is a key element in the Hanukkah celebration and plays a large role in cooking the traditional foods. Fried potato pancakes, called latkes in Yiddish and levivot in Hebrew, are the most popular Hanukkah food. They are shredded potatoes mixed with onion, egg, flour and seasonings, then formed into small pancakes and fried in oil. The crispy latkes are served with sour cream and applesauce on the side. 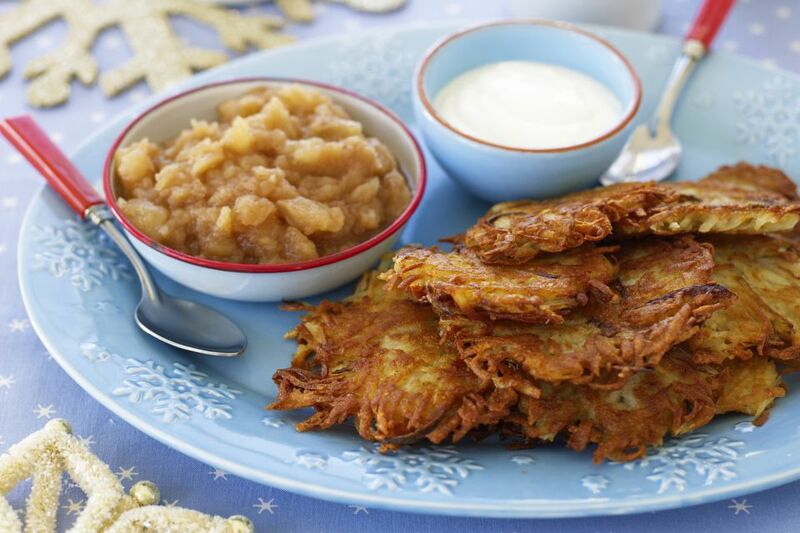 While traditional latkes are made from potatoes, today one can find many creative twists to the traditional latkes recipe. If you are looking for something a bit different, there are several internationally-inspired latke recipes, everything from curried sweet potato latkes to scallion pancakes to brandade potato latkes. Many of these contemporary latke recipes feature ingredients as diverse as pumpkin, cauliflower and the Moroccan spice blend ras el hanout. Another fried-in-oil delicacy for Hanukkah is the deep-fried, jelly-filled donuts, called sufganiot, which are traditionally enjoyed during Hanukkah in Israel and loved by children all over the globe. After lighting the Hanukkah menorah together, you and your guests will enjoy sitting down to a traditional meal, especially on the Friday night (Shabbat) of Hanukkah. Brisket is a popular dish featured on Jewish holiday tables and since Hanukkah is during the winter, this slow-cooked cut of meat is a hearty, warming and welcome dish. Many cooks will also include a roasted chicken along with their latkes and a green vegetable. If you'd like to think outside the box a bit, try some of the recipes from a fun, festive Hanukkah menu that includes a fresh take on brisket, sweet potato latkes, delicious veggie sides and no-fry pareve desserts. One Hanukkah food tradition is eating dairy products, especially cheese, in commemoration of the Jewish heroine Judith (Yehudit) who helped secure an important military victory with the aid of her homemade cheese. If you'd like to prepare a dairy Hanukkah party menu, consider recipes for spinach tidbit appetizers, grilled salmon, pepper, cheese and sugared pecan salad, or beet risotto with greens and goat cheese. You may also want to try an out-of-the-ordinary farfalle with blueberries, red onions and goat cheese, or a spinach, feta and mushroom pie baked in a no-roll olive oil-enriched crust. There are quite a variety of Hanukkah desserts, from decorated Hanukkah sugar cookies, cupcake "menorahs," traditional Hanukkah donuts and contemporary cakes. This is the perfect opportunity to try that olive oil cake you were interested in or something different like baked olive oil doughnuts or Hanukkah gelt cookies.